"Do you have a solution for a stripped truss rod nut?" At first no, then the idea of a pin chuck surfaced. 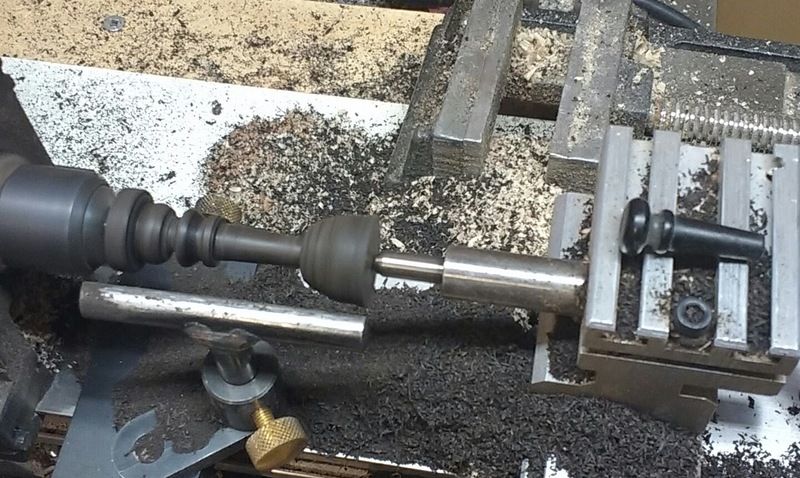 A pin chuck is used by pen turners that want to be able to turn a tube without a tailstock. A mandrel that is slightly smaller than the diameter of the tube and long enough to go into the tube and chuck, is used. A flat spot is filed or ground on the side, the length and diameter of the pin. 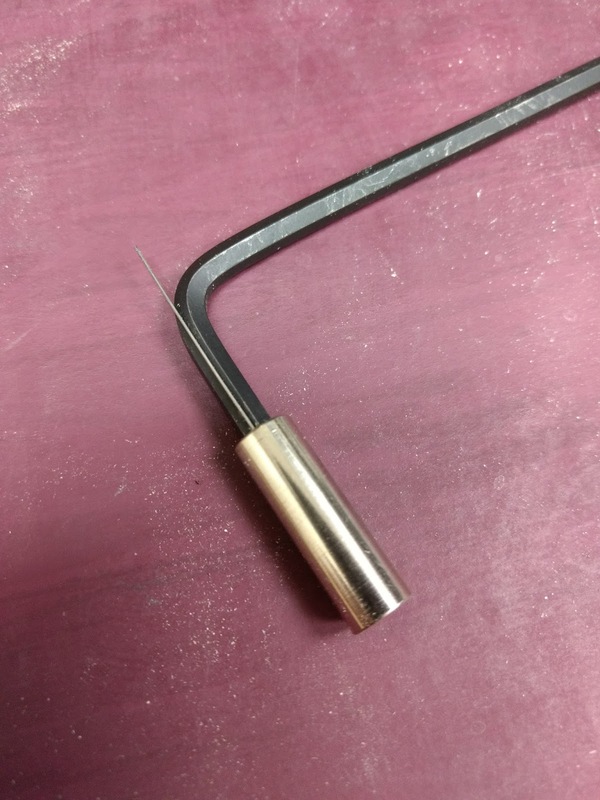 ( I used a transfer punch and a finishing nail with the head cut off for my first pin chuck) When it's inserted into the tube the pin goes to one side or the other and jams in place. A stripped 4mm truss rod nut was found. 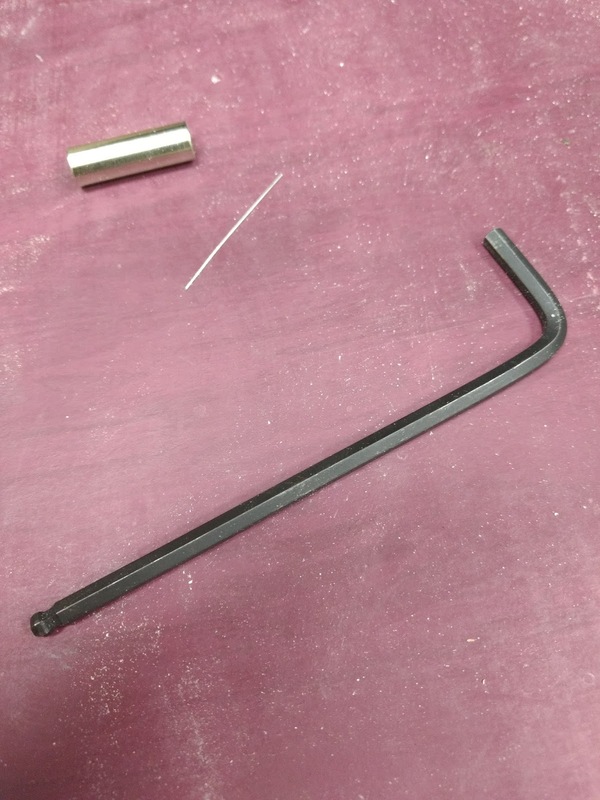 A one inch piece of .017 guitar string was inserted along one of the flat sides of a hex wrench. It jammed just like a pin chuck allowing the wrench to both tighten and loosen. My customer has a problem with his handmade archtop. 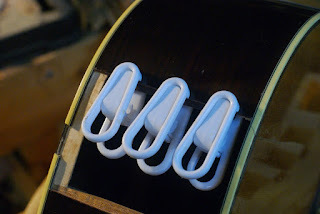 A tailgut is holding the the tailpiece and there's no room for a strap. This was a job for a new addition to the shop, the Taig lathe. Make an endpin with two grooves in it, one for the tailgut and one for a strap. It was straight ahead, ish, the taper on the end pin had to match the taper in the end block. A small tapered reamer was used to clean out the existing hole and provide a reference point. 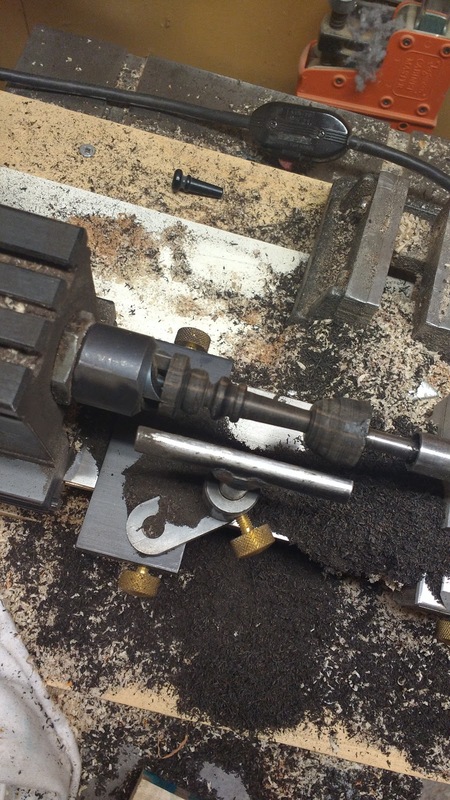 The outer most part of the reamer was marked and measured. Calipers were used to transfer the largest and smallest parts of the taper. After shaping, the peice was cut from the blank and final shaping and polishing were done in the drill press chuck. The original system stopped working, the owner was interested in something else. 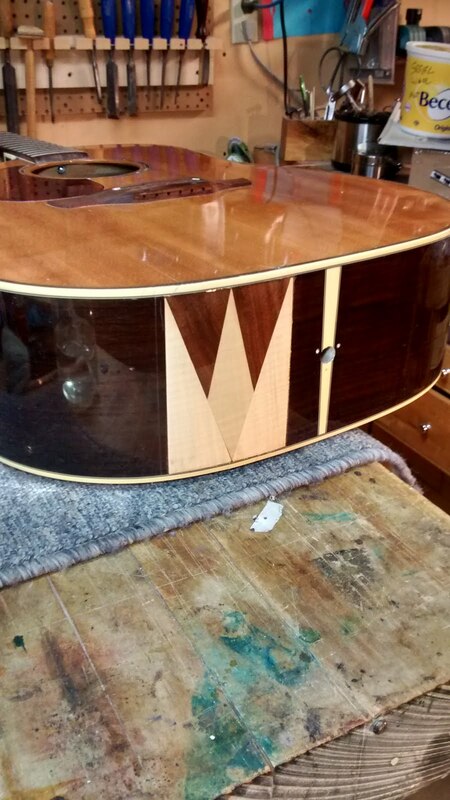 An in house FET powered system was made and mounted in a cover plate that suited the highly figured wood the guitar was made from. imho. 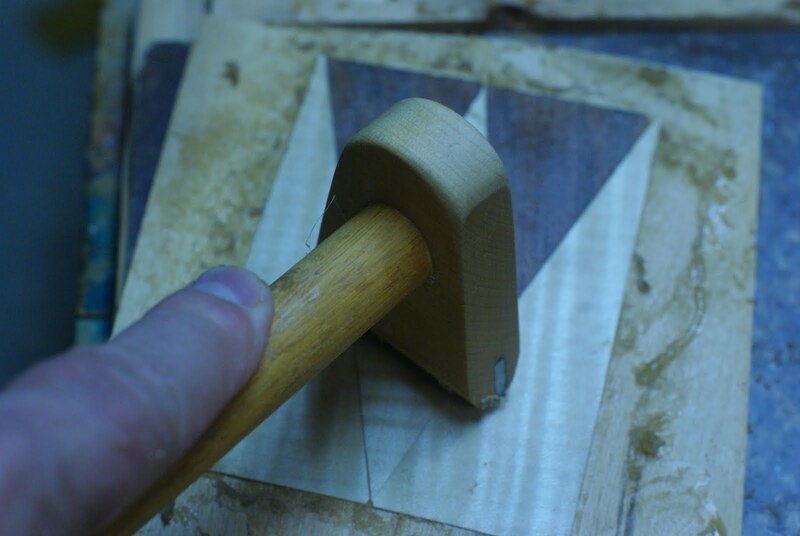 The knobs were made from walnut/mahogany offcuts using a jig with a plug cutter. They were then turned on the drill press and a steel pin indicator was inlaid into them. While the FET is old school I like it's tube like qualities it plays well with others and is great at warming up piezo pickups. Lee Valley has a hot hide glue pot and warmer that's a "replica of a classic Landers, Frary & Clark glue pot". I'm picking one up today and demoing it tomorrow at Lee Valley in Winnipeg from 10am to 2pm. I'll post my experience with it after I've had some time to work with it. Here's a llink and picture. 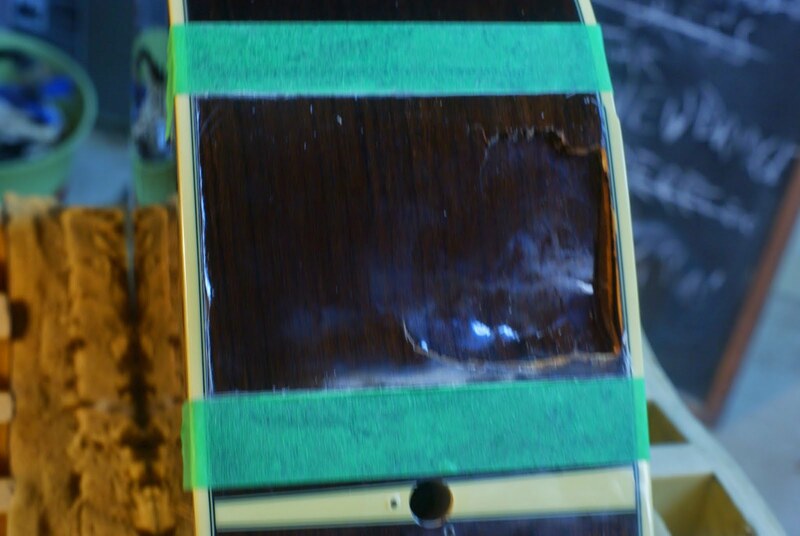 The damage to Guitars through air travel seems to be a much higher percentage than Guitars damaged through shipping. Someone should do study. After a lengthy assessment and conversation with the customer it was decided….The damage to the side couldn't be repaired in place, the decision was made to remove the damaged area and either replace it or repair it. It was removed by scoring the perimeter with an xacto blade until it cut through. 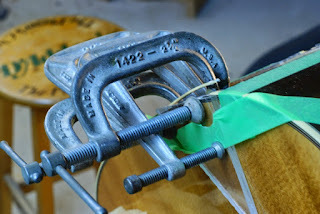 The top crack was glued together and reinforced with spruce cleats. A rosewood cleat was attached to the side to support the piece that was removed. 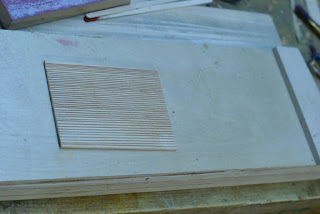 Kerfing was made to replace the missing and damaged kerf. The hole in the side made clamping these repairs possible. It didn't work, it almost worked, but the piece wanted to over bend and there was no way to adjust it. A new tactic was needed. 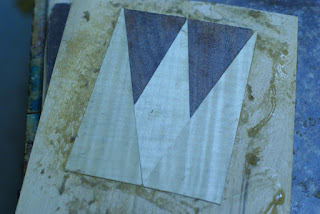 Inspired by Patrick Edwards video on using a veneer hammer and hide glue. A stylized figured maple and black walnut pattern of the owners initials was decided on. Facebook was crowd sourced for the final decision on maple/walnut or walnut/maple. The method: The veneer was glued on a ¾” thick piece of birch using hot hide glue and a veneer hammer. 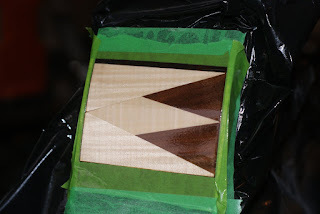 Once dry the piece was resawed slightly thicker than the side thickness and then thicknessed with the *belt sander jig. 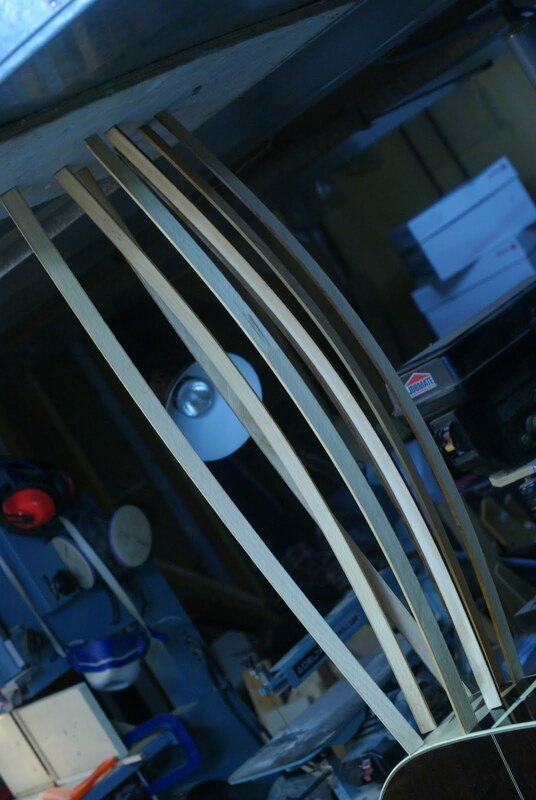 The birch was orientated perpendicular to the side grain to add strength. The piece was kerfed full width on the Fret slotting saw so it would flex to the curve of the side. 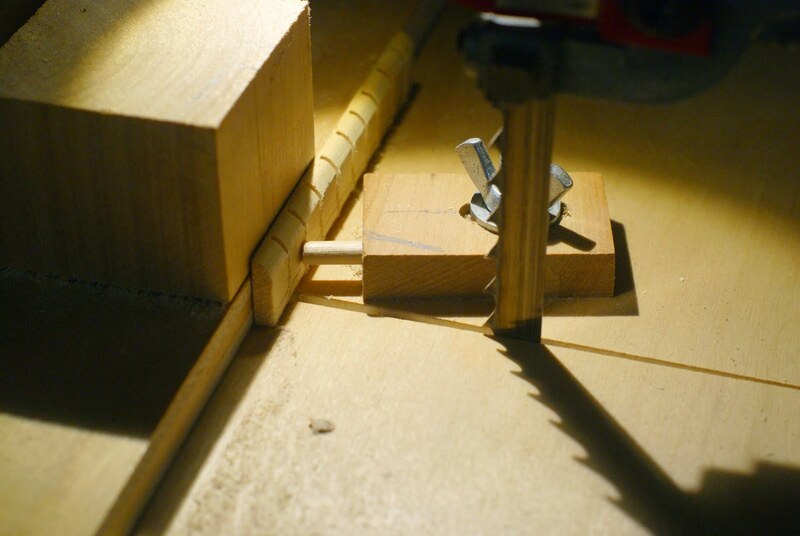 Once the piece was fitting and conforming perfectly to the side a clamping solution was needed. Go bars… a clamp that works like a convenient finger. The guitar Troji was used to hold the guitar bottom side up and a piece of plywood was screwed to the furnace vent. 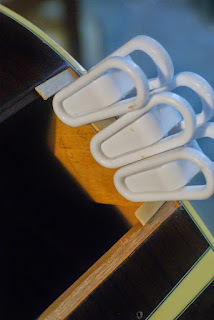 The go bars were bent between the bottom of the guitar and the plywood on the ceiling. After the glue dried the patch was masked off and clear coated. 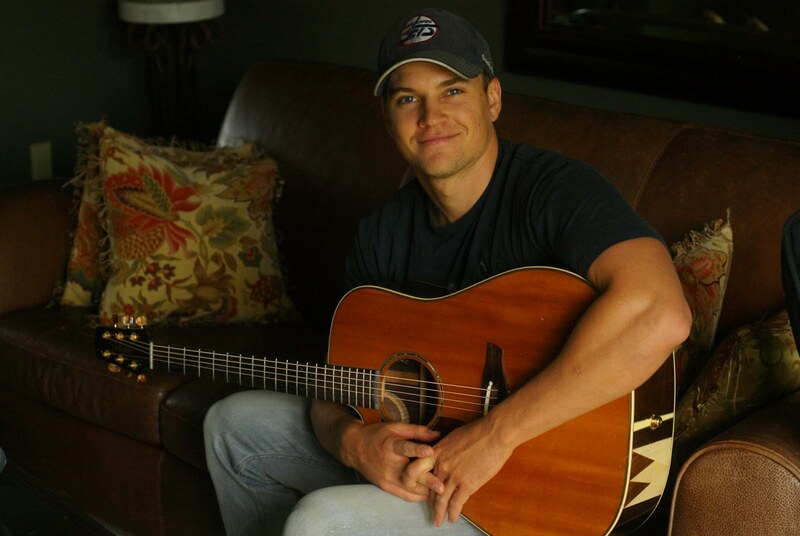 Marshall Williams actor/singer/songwriter was very happy with the repair. Finished with Glee, he's on the coast writing songs and waiting for his next acting gig. It all started as an intonation issue. The strings are very rubbery/slinky and they move a lot.....sooo the action needs to be on the high side. This means the string stretches and plays sharp, so we place the saddle to accommodate this. On this bass the bridge is straight across and the G and D strings are quite flat. Solutions? 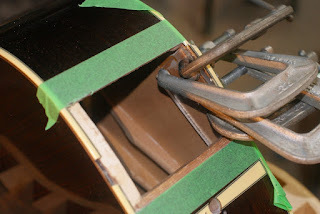 Recut the saddle slot, add a piece in front of the saddle, don't play up the neck. A handy piece of maple was wedged between the top and the string as a way of finding the right spot for the intonation to be correct. The right spot was in front of the bridge. A small piece of walnut was slotted and a two string saddle was made. Although this was better it brought us to the "How do you feel about playing a fretless bass" conversation. The owner was game. The pieces were cut and then glued into place with Titebond. CA glue is the usual choice in this shop, but not this time. We're not sure why. 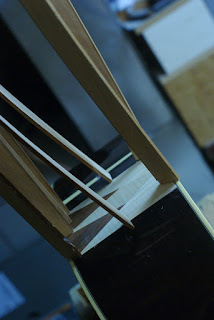 The tiny plane was used to trim the maple veneer flush and then the whole fingerboard was sanded with 150, 180, 220, 320 ......and then steel wool, 0000 steel wool, the good kind from Lee Valley that doesn't fall to pieces. The Bulldog stuff is so inferior it should be called something else like steelish wool. Or bits-of-steel-that-can't-wait-to-get-everywhere wool. It's the kind of thing you should buy as a gift for someone you don't like. It was a solution that worked, the customers happy taking on the challenge of playing fretless and the bass sounds better as a fretless. And the shop has a new fretless bass veneer cutting tool. It needs a better name. 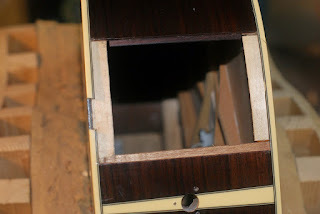 A badly damaged top requiring replacement of some of the top wood came in. A small section of the side was pushed in and would have to be put back in place and supported. 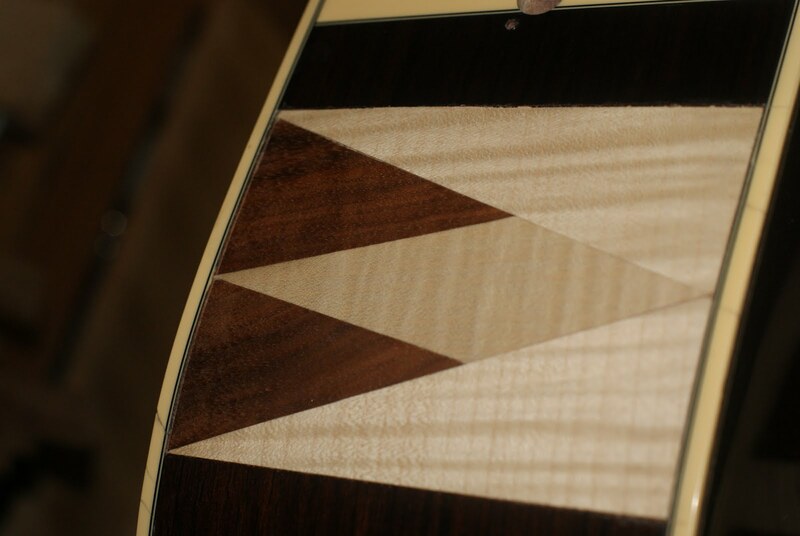 The finish on the headstock veneer was damaged and needed to be refinished. 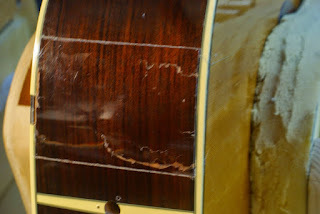 There was a crack opposite the larger one on the bass side of the lower bout that would need a cleat and another smaller one on the bass side shoulder. The top was marked and then scored using a metal ruler and a sharpened xacto knife. (I like to hone new blades so they're very sharp rather than sharpish) The knife left a very clean and straight edge to glue a patch to. The top was cleared using a small saw that usually cuts out the hole for a side mounted pre amp, it was perfect for this job. The remaining wood was cleaned out using a half inch skew chisel and a tiny micro chisel. 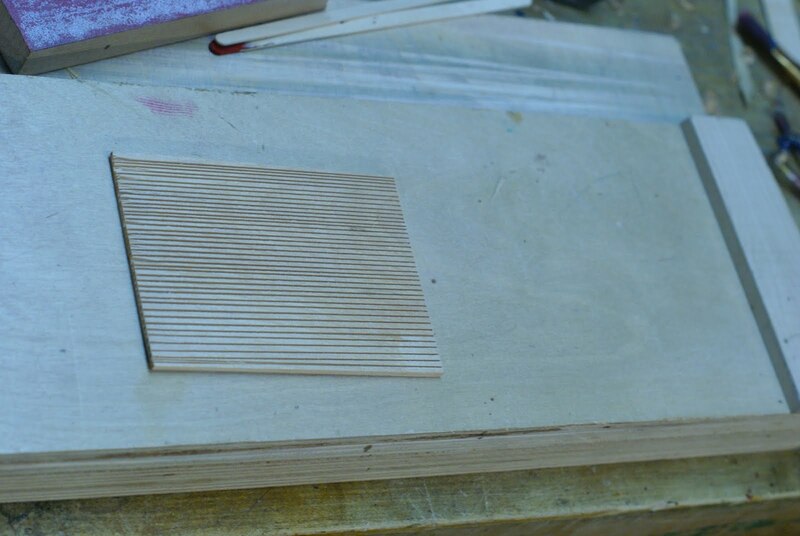 A matching piece of spruce was milled to thickness, a few off cuts from this were put aside to match the finish. The objective at this point was to match the finish first and then cut the patch using an already fitted template. Theory being that this would be a cleaner repair that wouldn't require refinishing the top or a section of the top. It turns out that the water borne finish I was using played well with the Taylor UV finish and spot finishing wasn't out of the question. The side patch was done first and bent slightly under the curve while the outside caul was made slightly over the curve. This helped get the patch to fit fully and compensate for the small amount of springback. 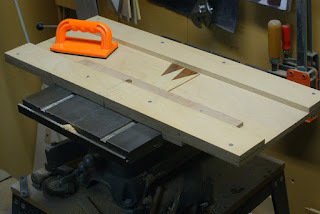 Clamping in place was made easier with the top piece removed. The top piece was glued in place and further supported with cleats held in place with magnets. The crack on the other side was also cleated and finished. The crack on the bass side shoulder was glued and clamped and then spot finished. 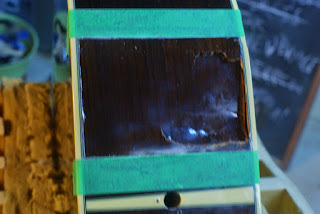 Unrelated damage to the finish on the headstock was repaired by sanding back and applying finish with a brush. After several coats it was sanded flat and polished out. Another unrelated repair was a broken index pin on one of the machine heads. 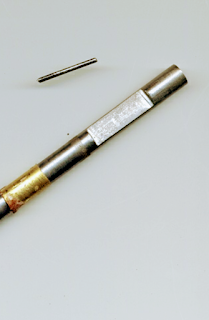 A small hole was drilled where the index pin had been and a salvaged pin from a Sperzel tuner was pressed in place. The tuner was working like new. An involved repair with a happy ending.